Gaurav Negi recalls his heart-warming and humbling meeting with the family of Major Padmapani Acharya, who was awarded the Maha Vir Chakra posthumously for his heroic feat in the Kargil war in 1999. An occasional series. In April 2007, I met author S S Gandhi at his residence in Vasant Kunj in New Delhi. Gandhi has penned the book Portraits of Valour which contains information on all gallantry awards given out before and after independence, with details of the brave individuals who have been honoured with the prestigious awards post independence. Armed with this bible of my 'Gods in Uniform', I started my search for my first God: Shaheed Major Padmapani Acharya who received the Mahavir Chakra after Operation Vijay in Kargil in 1999. I met Shaheed Major Acharya's wife, daughter, father and mother for the first time at their residence in Hastinapuram Colony on Nagarjuna Sagar Road in Hyderabad in July 2007. My feelings at meeting a martyr's family cannot be described in words. I remember that as a child, I used to sometimes ask my mother at bedtime to tell me stories about Shaheed Bhagat Singh and Rani Lakshmi Bai. I always believed that individuals like them were greater than Gods. I never imagined that one day I would come face to face with family members of such a God. 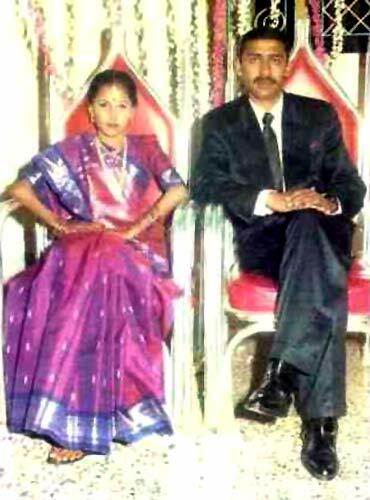 Charulatha Acharya, wife of Major Acharya, is a housewife. She was six months pregnant when her husband passed away. 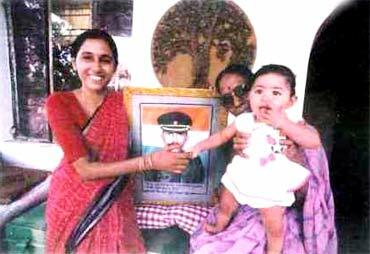 On June 21, 1999, the family had celebrated the birthday of Major Acharya, who was posted in Kargil at that time. Seven days later, on June 28, 1999, they were informed that he "fought bravely. He created history but he is no more". Major Acharya had made the supreme sacrifice of giving up his life while defending his nation. Charulatha Acharya delivered a baby girl in September 1999. 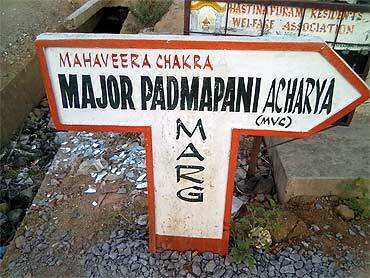 Major Acharya's daughter was named Aparjita (one who cannot be defeated). In his last letter dated June 19, 1999 to his father, Major Acharya had said, "Combat is an honour of a lifetime and I would not think of anything less. What better way to serve the nation". Abrahim Lincoln had once rightly said, "Let us have faith that right makes might and in that faith. Let us, to the end, dare to do our duty as we understand it." Despite the sacrifice and suffering they have endured, the Acharya family lives a simple life, sans flamboyance or show-off. They accepted Major Acharya's Maha Vir Chakra with grace and modesty. The soldier had proved to be a hero in the battle. But his family is no less heroic. Charulatha, who lost her husband at such a young age, continues to smile. Her daughter Aprajita has never seen her father. She misses him, but is proud of him. Major Acharya's parents lost their son but they have no regrets. Uncle (Major Acharya's father, who I addressed as 'Uncle') gave me a copy of the last letter his son sent him from the battlefield. In the letter, Major Acharya had also talked about Prime Minister Atal Bihari Vajapyee's visit to Kargil. 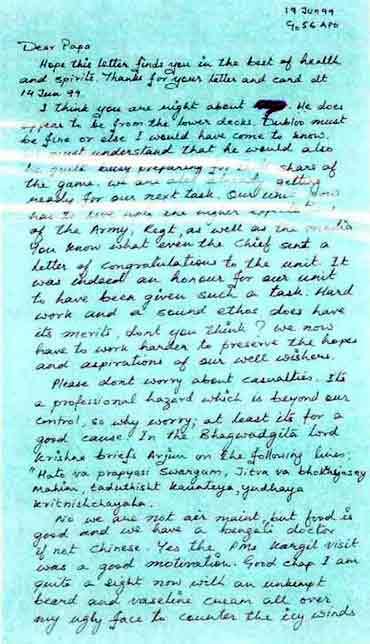 Uncle sent a copy of this letter to the prime minister, who replied to him acknowledging Major Acharya's sacrifice. During the gallantry award investiture ceremony in New Delhi on Republic Day, which uncle attended to receive the Maha Vir Chakra, Vajpayee came up to him and again thanked him for the letter. He also asked then President K R Narayanan to come up to Major Acharya's father to meet him. Uncle told me that he was touched by this gesture by Vajpayee. Shaheed Major Padmapani Acharya's father joined the Defence Research and Development Organisation in Hyderabad after his retirement from the Indian Air Force as Wing Commander. He has seen action during the India-Pakistan war in 1965 and 1971. His second son Padmasambhav Acharya was a captain in the Indian Army in 1999 and was a part of Operation Vijay in Kargil. He is now a Lieutenant Colonel. Vimala Acharya, mother of Major Acharya, is a social worker and now takes care of the Indane (Indian Oil) gas agency that the government of India has awarded to the family. On June 28, 1999, Company Commander Major Padmapani Acharya was assigned the formidable task of capturing an enemy position which was heavily fortified and covered with mines, sweeping machine gun and artillery fire. The success of the battalion and the brigade's operations hinged on the early capture of this position. But the company's attack almost faltered at the very beginning, when the enemy's artillery fire came down squarely on the leading platoon, inflicting large number of casualties. Disregarding his personal safety, Major Acharya took the reserve platoon and led it through a hail of artillery shells. Even as his men were falling to murderous enemy fire, he continued to encourage his men and charged at the enemy with his reserve platoon up the steep rock face. Unmindful of the hail of bullets from the enemy's position, Major Acharya crawled up to the bunker and lobbed grenades. During this daring assault, he was seriously injured. He was heavily injured and unable to move, but he ordered his men to leave him and charge at the enemy, while he continued to fire at the enemy. The enemy position was finally over-run and the objective was captured. But Major Acharya succumbed to his injuries after completion of the mission. 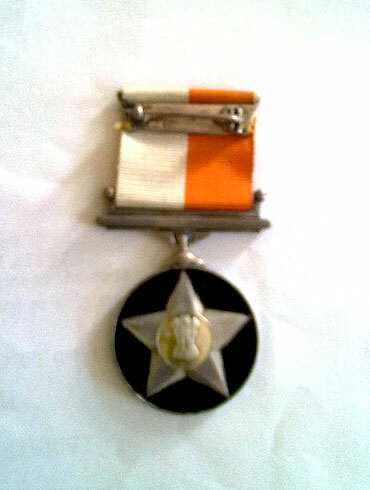 Major Acharya displayed exceptional courage, leadership and spirit of self-sacrifice in the face of the enemy. 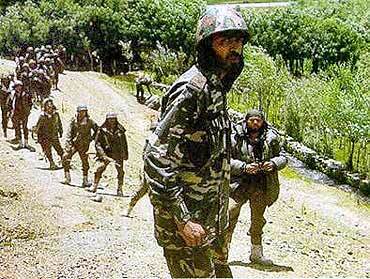 Have we forgotten Kargil already?